On August 11 at approximately 10:00 p.m. Calcasieu Parish Sheriff’s Office deputies conducted a traffic stop on an truck on Highway 171 in Moss Bluff for a traffic violation. 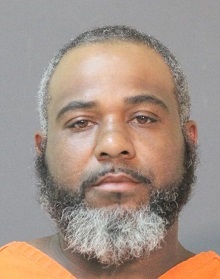 When deputies spoke with the driver, Barry D. Handy, 40, 1579 Georgia Road, Lake Charles, they could smell the odor of an alcoholic beverage emitting from his breath. Deputies also observed him to have bloodshot eyes and unsteady balance as well as slurred speech. During further investigation Handy advised deputies he has a hardship license from prior DWI offenses and is supposed to have an ignition interlock device on his vehicle, which he did not have. He also advised deputies he had been drinking. During a search of the vehicle deputies located 2 bottles of vodka inside the truck. Handy was arrested and transported to the Calcasieu Parish Sheriffs’ Office for a standard field sobriety test, which he refused. Deputies then attempted to perform a breath intoxilyzer test; which Handy also refused. After deputies learned Handy had 3 previous DWI arrests in the past 10 years they obtained a warrant to have his blood drawn for a toxicology report; he was then transported to a local hospital. After hospital personnel collected the blood sample he was transported back to CPSO and booked into the Calcasieu Correctional Center and charged with DWI 4th; ignition interlock device offenses; failure to signal; and operating unlawfully with a hardship license. Judge David Ritchie set his bond at $110,250 with special conditions being he cannot drive without permission from the courts, he must wear an alcohol detecting ankle bracelet, must not consume any alcoholic beverages, must be subject to random drug and alcohol screenings, and cannot commit any other crimes. CPSO Deputy David Armstrong was the arresting deputy on this case.